The Canon Pixma TS8051 printer is a versatile and flexible printer which can easily match-up with your home office. The printer has dimensions of 37.2x32.4x13.9 cm and a weight of 6.5kg. The simple, compact, and portable design increases its aesthetic. This printer works well with the system having MAC and Window OS. Along with the multiple wired and wireless connectivity options this printer makes the printing process more convenient. Now, it is easy to take prints of the document from wherever you are. Taking leverage of the AirPrint service, one can print the documents using the mobile devices or tablets. You can connect with the services such as Dropbox and Evernote without any obstruction. Moreover, Wireless PictBridge is a supplementary for printing the document or photos directly from the camera. A 6-ink tank system provides an extensive colour spectrum which makes sure that the picture/ document is captured on the paper with no loss of detail. The print resolution of Pixma TS8051 is 9600x2400 dpi, with a 15 ppm and 10 ppm for greyscale and colour respectively. Besides this, the scanner offers a splendid 2400x4800 dpi resolution and can scan a document in 14 seconds. All-in-one inkjet printer with compact size and impressive look defines Pixma TS8051 printer. The 4.3 inch touchscreen makes it easy to select print, copy or scan the document. Cloud printing, built-in Wi-Fi and separate 6 Canon Pixma TS8051 ink cartridges are some of the crucial features which add more value to this printer. If you are surfing for some affordable printer with versatile functionality for your home or office then, Canon Pixma TS8051 can be your choice. How to change the Canon Pixma TS8051 ink cartridges in a Canon PIXMA printer? Note: Before starting you will need to have the extra ink cartridges that are compatible with your printer. If you are yet to do this, please purchase an ink cartridge in order to avoid any printing delay. Step 1: Open the printer cover carefully and make sure it is properly propped. Open the support brace located at the right side of the cover. Step 2: Remove the new Canon Pixma TS8051 ink cartridge from its original packaging. Step 3: Before you install the new ink cartridge, remove the strip of protective tape from it so that the print nozzle and electrical contacts are released. (The printer should have a cartridge slot that is labelled ‘B’, this slot is where you will place a new black ink cartridge). Step 4: Push the cartridge up and back into the ‘B’ slot until you sense it click into place. Step 5: Repeat the above process with the colour cartridge. Place the colour Canon Pixma TS8051 ink cartridge into the slot labelled ‘C’. Step 6: Remove the support brace from the cover and place the printer lid into its closed position. There should be a green flashing light in the top of the printer at this point. If no such light is visible then you have not installed the cartridges in a wrong manner. Once you see the light, you can start the printing task. What to do if the disc tray is jammed? Step 1: Pull out the disc tray smoothly. Step 2: If you are unable to pull out the disc tray, turn off the printer and turn it back on again. The disc tray will be automatically be ejected. Step 3: When the disc tray is pulled out, place the disc tray ("M" is on the upper side) again and retry printing. If the tray is still jammed, there is a problem with the printable disc. Q. 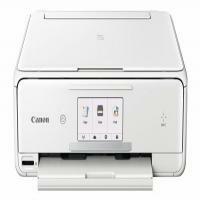 Can I perform duplex printing automatically using the Canon Pixma TS8051 printer? A. Yes, you can perform duplex printing automatically using the Canon Pixma TS8051 printer. Q. Is there any difference between PGI-570XL ink cartridge and the CLI-571XL? A. Yes, the PGI-570XL ink cartridge is used by the Canon Pixma TS8051 printer to print black and white photos where as the CLI-571XL ink cartridges are available in different colours (Black, Cyan, Grey, Yellow, Magenta) and are used to print pages in monochrome or colour. Q. What is the use of the waste ink absorber in the Canon Pixma TS8051 printer? A. The purpose of the waste ink absorber in this printer is to safely collect any waste ink expelled during cleaning of the print head and borderless printing on photo printers. Over time, this waste ink absorber can become full and will need to be replaced. Q. Can you assure me that your compatible Canon Pixma TS8051 Ink Cartridges will cause no problems to my printer? A. Yes, we guarantee that the use of our compatible cartridges will cause no problems to your Canon Pixma TS8051 printer. These are FSC tested products and come with a warranty period of 12 months, thus enduring their quality. Also, these compatible cartridges are guaranteed to produce the same quality of output as original cartridges. Q. How do I install the printer drivers on my computer? A. To install the printer drivers on your computer, you can use the CD-ROM that you received in the box of your printer. You can also download the driver installation file from Canon’s website. You can use this link to download the driver for your OS. Q. What does the flashing of the ink lamp of the Canon Pixma TS8051 printer indicate? A. It depends on how frequently the ink lamp is flashing. If it is flashing slowly (at around 3-second intervals), it means that the ink is running low and you should prepare to get new Canon Pixma TS8051 Ink Cartridges. The print quality under this condition may not be satisfactory. If it is flashing fast (at around 1-second intervals), it means that the ink cartridge is installed in the wrong position or the ink in the cartridge has run out. In this case, you need to get to new Canon Pixma TS8051 Ink Cartridges to continue printing.